On Saturday December 19, DESTINATION:trance will be broadcasting their annual Top 50 show counting down the top 50 trance tracks of the year. 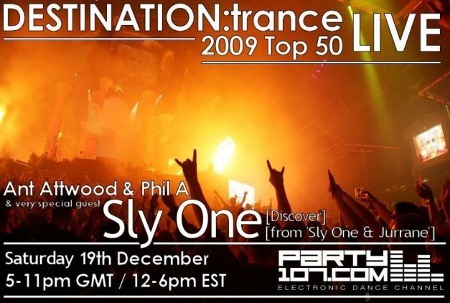 Ant and Phil will be joined LIVE by in-studio guest Sly One of UK duo Sly One & Jurrane who will help them mix the top 50 tracks as well as spin a one hour LIVE and exclusive guest mix. - Post in this thread on the forums. The 100% LIVE 6 hour broadcast straight from the UK starts Saturday, December 19 at 12:00 PM Eastern / 18:00 CET / 5:00 PM UK! Due to inclement weather in the UK, Ant, Phil, and Sly One were unable to travel to the same studio to do the DESTINATION:trance Top 50 show as scheduled. They are working to reschedule the show for the next available opportunity and updates will be posted as available.